Every so often, I like to have a minor overhaul of my makeup, throwing out bits that aren't up to scratch in the makeup stakes, have gone a little past it or those that I'm neglecting a little too much. Doing this also allows me to fall in love all over again, with products that have taken a backseat when a more recent purchase has come into the spotlight. 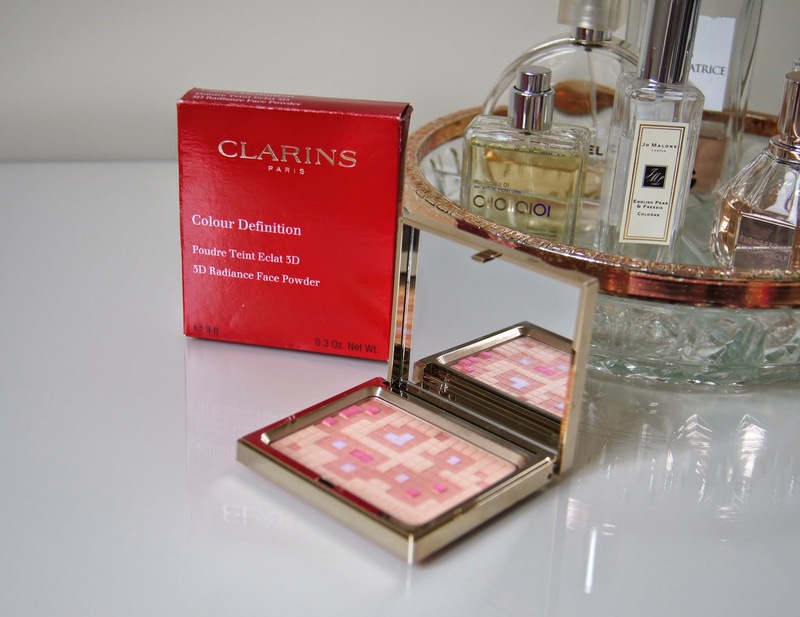 This time round, I rediscovered the Clarins' Colour Definition 3D Radiance Face Powder and thought I'd do a quick review, as even though it came out over a year ago, Clarins are always bringing out new powders that have a similar idea behind them. 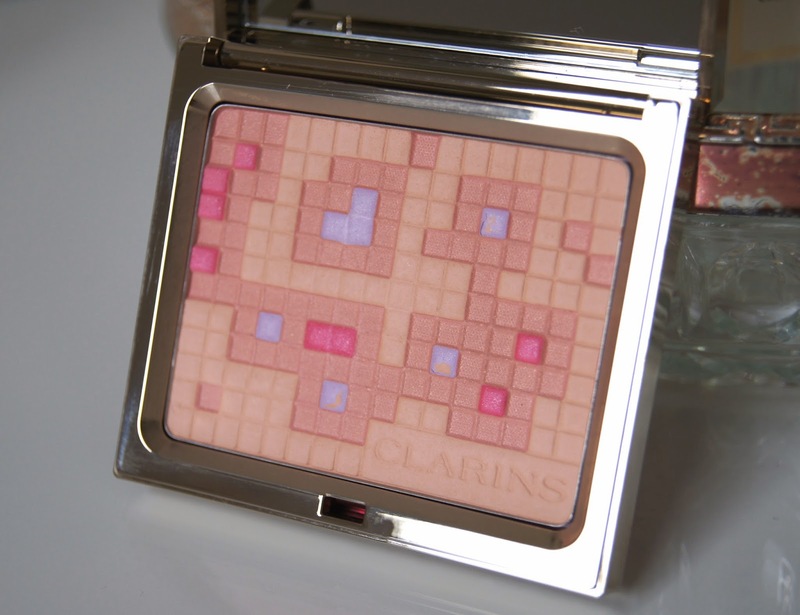 Who can resist a beautifully embossed, Clarins powder? Whenever there's a new release, you can guarantee another gilded piece of gorgeousness will lure me in. Obviously, when this one came out, I yet again, couldn't resist! The pixel motif is unusual and the idea behind it, makes the product that little bit more interesting, rather than just aesthetically pleasing. Apparently, each of the four, different tones add a separate, perfecting element to the powder. The combination of colours blend when you swirl a brush around them, creating a dusting of powder that will even out your skin tone, thanks to the beige and peach shades, and will give your face a lovely luminosity, courtesy of the raised squares of pink and lilac. The velvety texture of the powder leaves the skin so soft and smooth, mattifying shine, combating redness and boosting radiance, all at the same time. Thankfully, it refuses to dry out the skin, like some powders tend to do and doesn't leave your face looking at all caked in makeup. With it being so sheer, it won't add an extra boost of coverage, however it perfects what's already there. If I'm feeling, and more importantly, looking slightly lacklustre, this powder helps to brighten my face somewhat. I do feel that this powder does exactly what it says on the tin and I just can't get over the sophisticated, classy exterior! A signature of Clarins, the small, sleek, gold compact is just so luxurious and special. It's slightly weighted, but not too heavy to carry around in your makeup bag. Being the perfect size, it has a mirror inside, making it perfect when you're on the go and need to whack out for a top up. What do you think of the Clarins makeup?